In 1883 Edvard Grieg came to Holland for a number of concerts in which he featured as the soloist in his own piano concerto. Röntgen en Grieg had already met each other once before in Leipzig and Grieg’s visit to Holland provided an excellent occasion for Röntgen to invite him to come and stay in Amsterdam. Grieg accepted the invitation replying: “I look forward to seeing you and your wife again; make sure that one day lasts 48 hours!” Grieg’s stay at the Röntgens would not last one day, but one month. Thereafter, both musicians were connected by a warm bond of friendship which would last 24 years, until Grieg’s death in 1907. During his visit to Holland in 1883 Grieg stayed with Röntgen in his house in the Van Baerlestraat. After a long and tiring concert tour through Germany he had arrived in Holland exhausted, but during the weeks thereafter the Röntgens gave him every opportunity to recover. After his stay in Amsterdam Grieg left for Italy, where he remained four months. In July 1884 Röntgen paid his first visit to Norway. 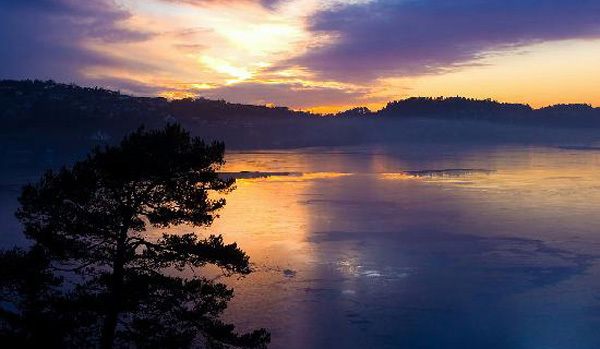 In the end he would go and see Grieg a total of 14 times, usually during the summer holidays. Together with Grieg and his friend, the lawyer/musician Frants Beyer, he undertook long and adventurous hikes in the Norwegian mountains of Jotunheim. View of the fjord from Troldhaugen, Grieg’s house near Bergen. The piano works alluded to here are the 5th series of Lyrical Pieces (op. 54), of which, in all, ten volumes were published. The 9th volume, op. 68, includes Abend im Hochgebirge, initially written for the piano, but later arranged by Grieg for the oboe, French horn and string orchestra (or piano). Eating oysters in restaurant ‘Die Port van Cleve’ in Amsterdam, usually after a concert, was a set ritual whenever Grieg was in Holland. Grieg’s acquaintance with the Concertgebouw Orchestra would soon have a follow-up: in the Summer of 1898 Bergen was to organise a big fishing- and industrial exhibition. Grieg wanted to organise music festivities to go along with this and to invite the Concertgebouw Orchestra for the occasion. Röntgen liked the idea and offered to act as a mediator. The Concertgebouw Orchestra was willing to come, but the committee of organisers in Bergen appeared to resist the cooperation of a foreign orchestra to a Norwegian music fest. Grieg was most indignant about this and defended his intentions with a letter of protest, in which he wrote that it does not matter if Norwegian music is performed by Chinese, Japanese or Dutchmen, as long as it is performed well and that, after all, Norwegian orchestras are made up of mostly German musicians anyway. One year later, in 1905, Röntgen celebrated his 50th birthday. He received an album with contributions from friends from all over the world. Grieg sent a short composition: “Sehnsucht nach Julius “. This attractive little piece was later published with the title Resignation, as part of his last pianowork Stimmungen op.73. In that year Grieg hardly managed to compose anything at all. He empathised a great deal with the political developments in his country which would ultimately lead to independence for the kingdom of Norway. 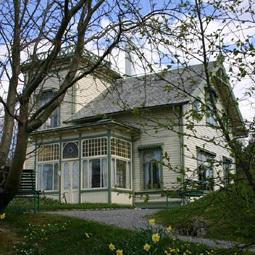 In 1907 Grieg and Röntgen were invited by King Haakon VII to the royal manor house in Christiania. They gave a concert there together and during this occasion Röntgen was awarded the Order of St. Olaf. Nina Grieg also performed; it was the last time she and Edvard played for public together. Grieg grew steadily weaker and knew the end was near. That same year Röntgen visited Troldhaugen for the last time. Grieg felt suddenly better, also because Percy Grainger, the Australian pianist whom he had met shortly before and whose interpretation of his piano music gave him much joy, joined them. Grainger broke new ground with his reseach regarding folk music in English speaking countries with the aid of a phonograph. Grainger, Grieg and Röntgen became best friends immediately. But for Grieg the end was nearby. It was with great sadness that Röntgen finally said goodbye to Grieg, knowing that they would probably not see each other again. Shortly afterwards Grieg died, on 4 September 1907. 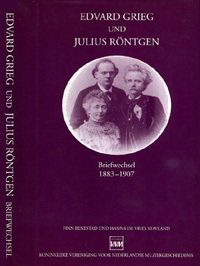 The biography of Grieg by Röntgen was published in 1930. Memories the writer has are alternated with fragments from letters from Grieg himself making Grieg speak to the reader directly by way of his letters, carefully selected by his biographer and close friend. In 1993 the book came out in Norwegian on the occasion of Grieg’s 150th birthday. 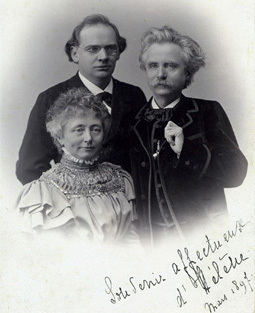 Finn Benestad and Hanna de Vries Stavland: Edvard Grieg und Julius Röntgen, Briefwechsel 1883-1907 (KVNM, Utrecht, 1997). This correspondence makes for a unique document in which the composers remark candidly upon works by themselves or others and report about their colourful experiences on a musical, social or political level. More than two hundred letters, postcards and telegrams written by Grieg are in the Gemeentemuseum Den Haag (Municipal Museum The Hague), whereas the 176 letters Julius Röntgen wrote are kept in the Public Library in Bergen. A few of Röntgen’s letters have been mislaid, presumably during Grieg’s international travels. 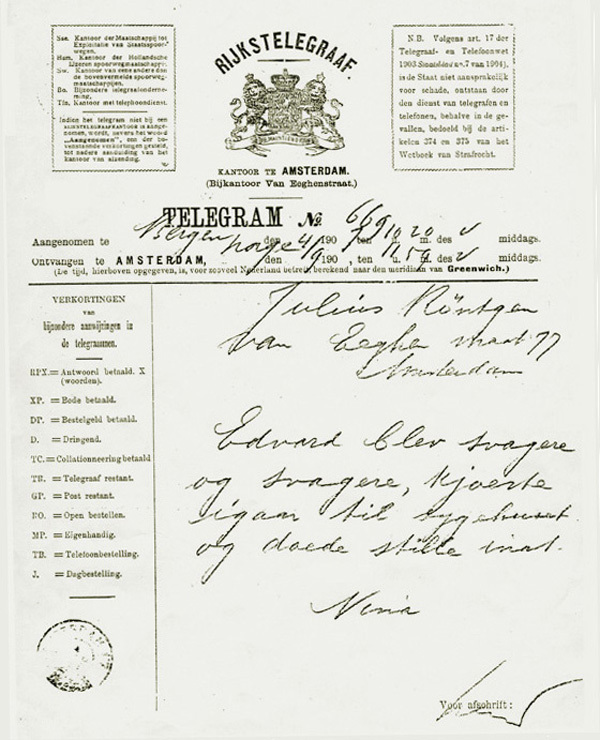 Telegram from Nina Grieg, 4 September 1907, after Grieg’s death. “Edvard grew steadily weaker, was taken to the hospital yesterday and died peacefully last night “.